Just a few days ago I saw some small rolls that were shaped as a snail display by a bakery shop's window. They made my heart chuckle, momentarily I didn't worry too much about a mountain of chores and a photo-shoot project. Something about bread... if you've experienced making it, you'd know, that 'life' inside really can touch your heart. Saw it on tv, some bakers made a sign of a cross right after a tea towel was laid on a dough that was ready for proofing. In Barcelona, very often bread is used for celebrating. The dough of festive loaf normally is enriched with egg, milk and butter. 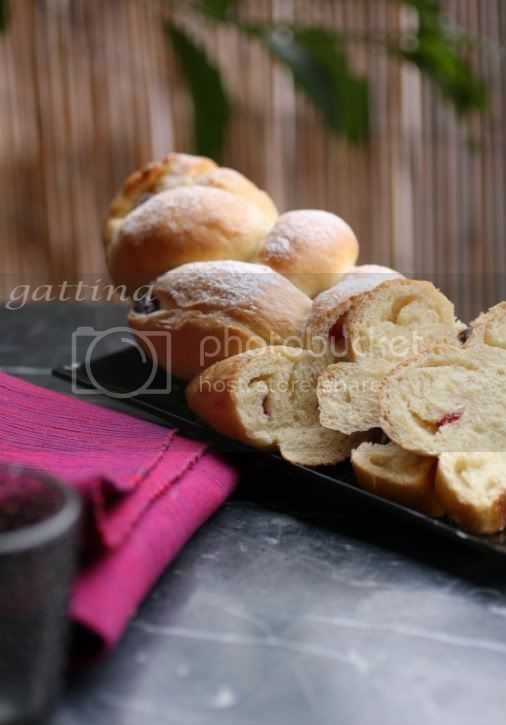 Although a local food culture may vary it by adding pastry cream or dried fruit or shaping it to a certain way, the flavor of the bread itself is not much different from any other sweet bread's ... like cinnamon rolls for an example. But since this dough includes a bit of lemon/orange zest, I find it taste more lovely after adding in some candied citrus fruit. Warm up the milk, sugar and butter, take away from the heat source once the butter melts. Let the temperature cool off to reach lukewarm, add in fresh yeast to dissolve. Combine the milk mixture with the flour, yolks, salt and orange zest. Knead the dough until elastic and smooth. The dough shouldn't feel dry, it maybe slightly wet, but not sticky to hand. Cover, and proof in a room temp of 75F and it doubles its volume, about 1 - 1 1/2 hours. Knead the dough a few times, just enough to re-distribute the yeast cells more evenly. Then it is ready for cutting into smaller portions, rolling and shaping (in between giving it a plenty of time of resting in order to accomplish a 'relaxed' gluten). Since the bread itself isn't too sweet, it is ideal for filling with custard/cream/cinnamon sugar etc. Bake the bread, depending the size you made, until golden brown. The bread still tastes great on the next day, but still best to consume it within a day or 2. 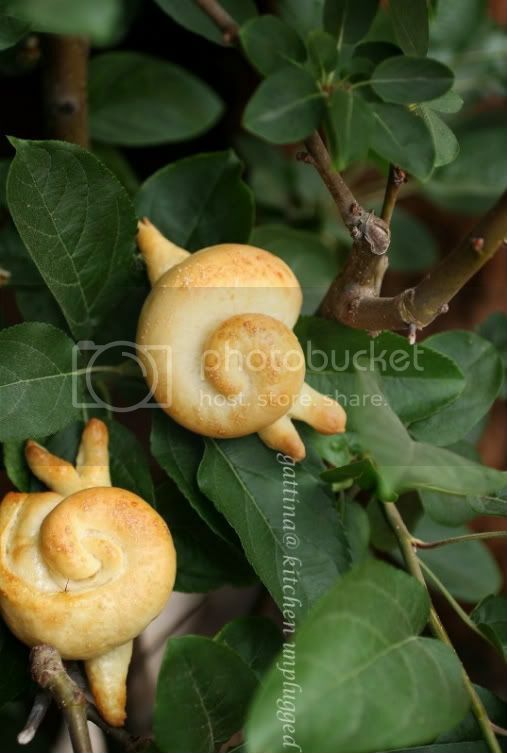 Any idea how to shape a snail bread??? Just like the one shown here from bakeries. Yummy! those snails are so cute! I love your snails, look amazing!I'd say that was a perfectly beautiful idea. I am so impressed. ciao. These are fantastic, whimsical, and very original. Love that first photo in particular. Gattina you are always my hero! I love these, they capture your whimsy and I agree that something delightful like this can make your day so much brighter! Hope you do manage those step-by-step pics sometime soon. Oh wow these look so so cute and adorable! Waw!! these look like real snails only these taste better, ..hahahaha! The sfilled snaoils look so tasty,..a bit weird but very special!! Tengo 84% en mi examen de español!!! those snails are adorable! i was born and lived most of my life in BCN, now i live in the us... i hope you've had the time to try crema catalana, i just posted a recipe for it! i'll keep reading your blog! What a great idea to shape loaves into interesting and fun shapes! Kids would love this! Long time never visit you. How have you been? Your blog is still as lovely as before.